This is a 2019 bump to https://support.mozilla.org/en-US/questions/1221476 . Firefox renders text incorrectly. It uses DirectWrite, which is incorrect, it should use GDI to render text. In all the next updates please immediately rewrite the Microsoft Windows renderer sourcecode to render all text with GDI. This is a 2019 bump to https://support.mozilla.org/en-US/questions/1221476 . Firefox renders text incorrectly. It uses DirectWrite, which is incorrect, it should use GDI to render text. In all the next updates please immediately rewrite the Microsoft Windows renderer sourcecode to render all text with GDI. It this still about bitmap fonts? Using GDI classic to render would be about gfx.font_rendering.cleartype_params.rendering_mode (2). It this still about bitmap fonts? 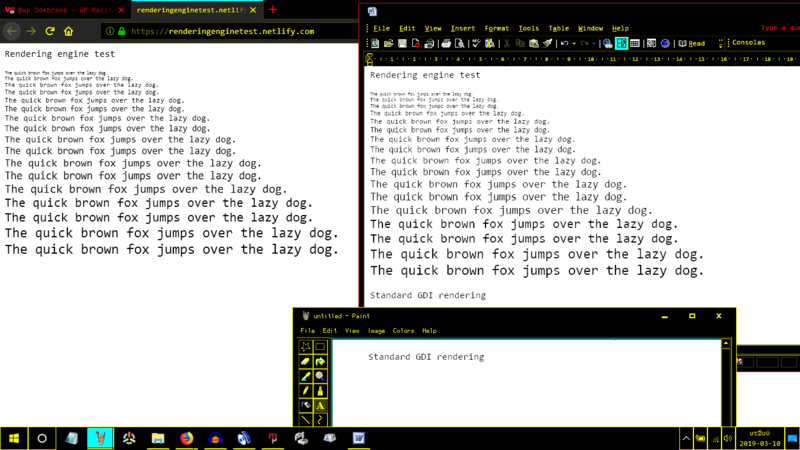 Using GDI classic to render would be about gfx.font_rendering.cleartype_params.rendering_mode (2). "It this still about bitmap fonts?" Yes, it is. GDI always returns a font list including any bitmap fonts installed, as can be seen in Notepad. ''cor-el [[#answer-1201104|said]]'' <blockquote> It this still about bitmap fonts? Using GDI classic to render would be about gfx.font_rendering.cleartype_params.rendering_mode (2). *[[/questions/1233884]] Fonts not looking good on Firefox </blockquote> "It this still about bitmap fonts?" Yes, it is. GDI always returns a font list including any bitmap fonts installed, as can be seen in Notepad. I have 65.0.2 and i like the font how its look. I don't know how you want to show. I compare the Consolas font with the Notepad and i don't found a big difference in pixels. If you want the font like in Chrome, So Blurry, So Lite, So hard to read. Sorry then. I don't want to change. I have 65.0.2 and i like the font how its look. I don't know how you want to show. I compare the Consolas font with the Notepad and i don't found a big difference in pixels. 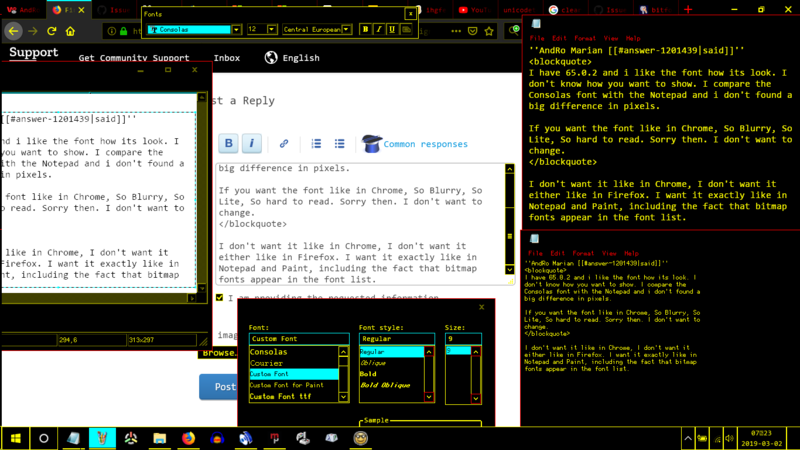 If you want the font like in Chrome, So Blurry, So Lite, So hard to read. Sorry then. I don't want to change. I don't want it like in Chrome, I don't want it either like in Firefox. I want it exactly like in Notepad and Paint, including the fact that bitmap fonts appear in the font list. 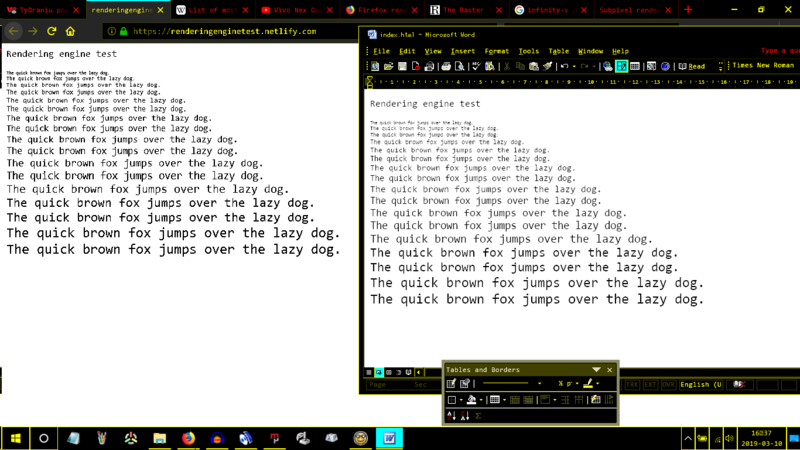 So the thing is GDI doesn't do any weird things regarding rendering of bitmap or vector font, it does everything exactly like in the font. That's why Consolas was hinted properly in both of the programs that rendered in GDI. And by Paint, I don't mean, that, ugh, version from Windows 7 and above. Why the heck does Firefox use the wrong rendering engine?! 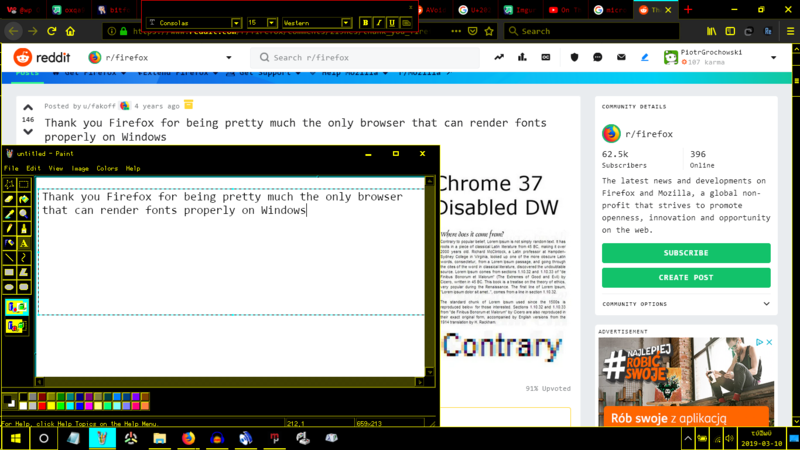 I changed a setting in the font, what I got was this: https://i.imgur.com/q2Hc7BL.png Why the heck does Firefox use the wrong rendering engine?! Symmetric smoothing is a setting in the font. Both render exactly the same in GDI. However in Firefox the former has that nauseating blur to it, while the latter has many creases in text as if it was rendered with ClearType. In fact, I have a very similar problem in Android where text would render correctly but in AndroidChrome it has that nauseating blur (but only inside webpages, not in the GUI). I am using the exact same Consolas font on that tablet. Here is the text rendering with symmetric smoothing on: https://i.imgur.com/rLqw4g4.png And here it is with symmetric smoothing off: https://i.imgur.com/7rkvcAA.png Symmetric smoothing is a setting in the font. Both render exactly the same in GDI. However in Firefox the former has that nauseating blur to it, while the latter has many creases in text as if it was rendered with ClearType. In fact, I have a very similar problem in Android where text would render correctly but in AndroidChrome it has that nauseating blur (but only inside webpages, not in the GUI). I am using the exact same Consolas font on that tablet. ''PiotrGrochowski [[#answer-1203901|said]]'' <blockquote>In fact, I have a very similar problem in Android where text would render correctly but in AndroidChrome it has that nauseating blur (but only inside webpages, not in the GUI). I am using the exact same Consolas font on that tablet. </blockquote> Like this: imgur.com/QU99imY.png I hate this issue. Go to about:config and set gfx.text.disable-aa = true. Restart the browser. Go to about:config and set ''gfx.text.disable-aa'' = '''true'''. Restart the browser. Nope, doesn't solve it. https://i.imgur.com/dSIIb8i.png Compare with the other images. None of them is exactly the same as the programs that use GDI (Notepad, Paint in XP, Microsoft Office Word 2003, Android GUI). ''TyDraniu [[#answer-1203957|said]]'' <blockquote> Go to about:config and set ''gfx.text.disable-aa'' = '''true'''. Restart the browser. </blockquote> Nope, doesn't solve it. https://i.imgur.com/dSIIb8i.png Compare with the other images. None of them is exactly the same as the programs that use GDI (Notepad, Paint in XP, Microsoft Office Word 2003, Android GUI). But still, you should switch to GDI because it's objectively the best text renderer. 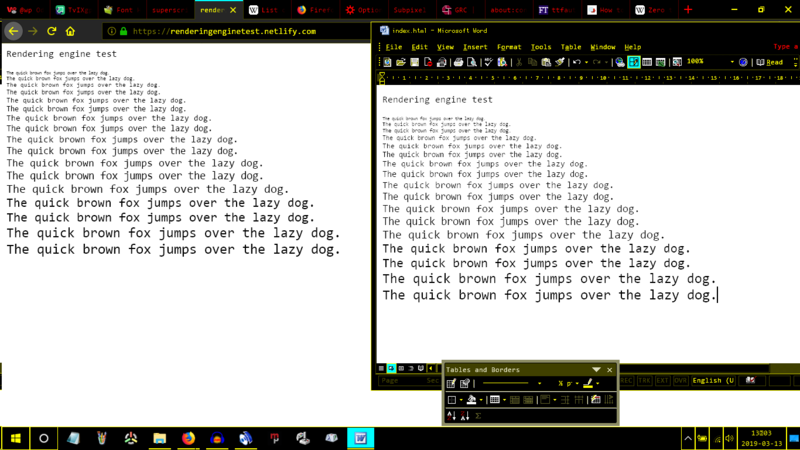 By adjusting the settings for the autohinter, I got it to render sharp: https://i.imgur.com/V1oC8jM.png But still, you should switch to GDI because it's objectively the best text renderer. Searching for fixes on the Internet, I found the true fix: change gfx.content.azure.backends from direct2d1.1,skia,cairo to direct2d1.1,cairo . 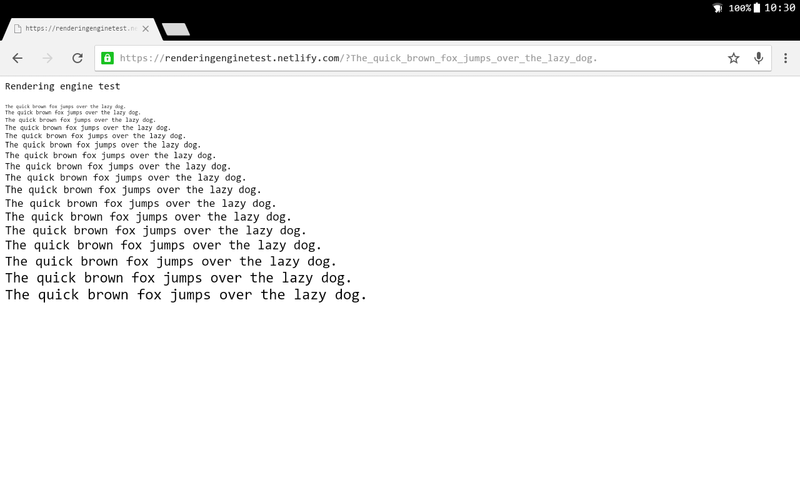 After restarting Firefox, this will make all text render in GDI, and allow using bitmap fonts. Should be the default in Firefox.